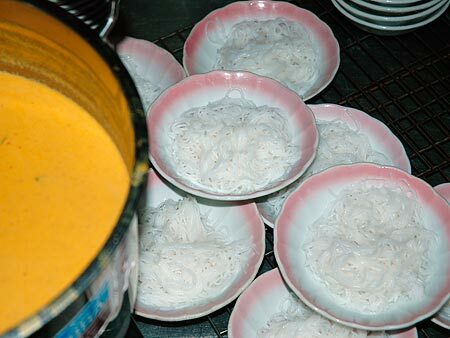 Kanom Chin (or Kanom Jeen) in bowls, ready to have nahm yah (a fish curry) sauce ladled over them, in Krabi, Thailand. Southerners eat them with plenty of vegetables from the accompanying vegetable platter. Kasma teaches how to make Kanom Jeen Nahm Yah (Southern-Style Rice Vermicelli Topped with Spicy Fish Nahmyah Curry Sauce) in Series Set E (class 2).